In January of 2013, I began an essay entitled “Drop Off.” On the surface, it was simply an essay about walking my son to the doors of his elementary school, watching him enter, and lamenting the fact that I couldn’t continue to walk with him down the halls to his room. Early drafts were flat, overly sentimental. I was having trouble finding the words for the sadness I felt at watching him toddle away, his backpack two sizes too big for him, as he entered his school. This was not an original sadness—so many parents must feel this way. And indeed, there are so many that write about watching their children leave them in a variety of ways: off to school, to college, to war, to marriage. I did something I rarely do in those early drafts: I scrapped them entirely when they didn’t work. They were short, meant to be lyric and descriptive. I started over with each new draft, no core DNA remaining from earlier drafts. The Newtown shooting at Sandy Hook Elementary happened on my birthday that year, December 14, 2012. I was teaching my last classes of the semester that day, had been sent balloons and cards arranged by my wife, and capped off a fine semester with fine students. The debilitating snows of Western New York hadn’t yet started, and while it was gray outside, there was a sense of peaceful conclusion to the academic world. Students were shuffling to their very last classes for the semester. Readying themselves for finals. They didn’t think twice about where they were going. I have a picture of me holding a bunch of balloons in the department office, a big dumb smile on my face. I’d been surprised by the gesture, even though my wife did things like this for me all the time. I ordered donuts for my early classes, and pizza for my students during my lunch hour class. We finished workshop and literature discussions and made a relaxed day of it. I hadn’t yet heard the news. While I was in my workshop class, the first of the day, 20 children were being shot in a school in Connecticut. I remember taking the leftover food from that class to the office, and receiving the balloons. My oldest son was at the time in kindergarten, perhaps settling in for a story or some sort of art class. My wife was at home with our 18-month-old, hearing the news soon after the events. I spent the remainder of my birthday hugging both my children in our house after my oldest was home from school. Kids are amazing at simultaneously reminding you of their perseverance and their fragility. We watched a nature special on television, and much of the rest of the day was a blur of couch-sitting and fort-building, crawling into those dark spaces my oldest would make with cushions and blankets where he would play his games talking to make- believe people and animals. His younger brother would tear down the fort and he would get angry, but we would rebuild. It felt possible that what I’d heard on television didn’t actually happen. After the announcement, with Christmas so close and the tragedy so jarring, the school didn’t immediately respond. For the remaining week or so before the break, there was a police officer at the front door, but little else really changed, and parents were starting to get worried. It was after the break that the changes happened. Parents were no longer welcomed to come in unless they had an appointment or were listed as official guests. Children were dropped off about fifty yards from the door. An armed guard was posted in the morning, and was there a good deal of the day standing near the office door which was right inside the four glass doors to the elementary school. The policy on weapons, which this tiny school in western New York State had never needed to spell out, was posted to all parents. Predictably this satisfied some parents and outraged others. For me, it meant a fundamental change to my everyday routine. Before, I parked in the back lot where the elementary school children’s parents were expected to park. I often saw the same people there: colleagues and friends from town whose children were friends of my children. We all walked together in the doors, where we would split up to take our children to their rooms. My son had troubles with his boots, which he wore the minute the cold weather came in November. We brought “indoor” shoes in a plastic bag and I resisted the urge, every day, to simply pull his boots off of him and help him put on his shoes. I watched, and encouraged, but let him do it, and the best part of my morning with him was after he’d finally put his boots under his coat, all hung or stored beneath his name on a series of hooks and spaces for him, and he kissed my cheek and ran away toward the class with his binder and his lunchbox in his hands. When students returned to classes in early January of 2013, this was no longer possible. The snow had finally come, as had the very cold temperatures, and so my son, looking like a Weeble Wobble, was to say his goodbyes at the curb and walk into his school, past the man with a sidearm at the doors, alone. I began the essay after that first day back at school, and it languished for nearly a month, constantly on the page and erased, in a liminal space of existence. The news was full of stories about gun violence. Comparisons to Columbine were beginning to surface again as the shock of the dead children wore off. The image of a gun on television became pervasive, intrusive, and cold. I’d already come to terms with my fear of guns long before, had written about it, thought I’d understood it. But there was something different about this fear. The gun wasn’t pointed at me, so to speak. An impulse to fantasize about rushing in to a school on lockdown with an active shooter started to fill feeds and Facebook updates. I wanted, more than anything, to see the gun come apart, to disassemble it, and I started looking for ways to supplement the essay I was having trouble writing with an image that might help me do that. 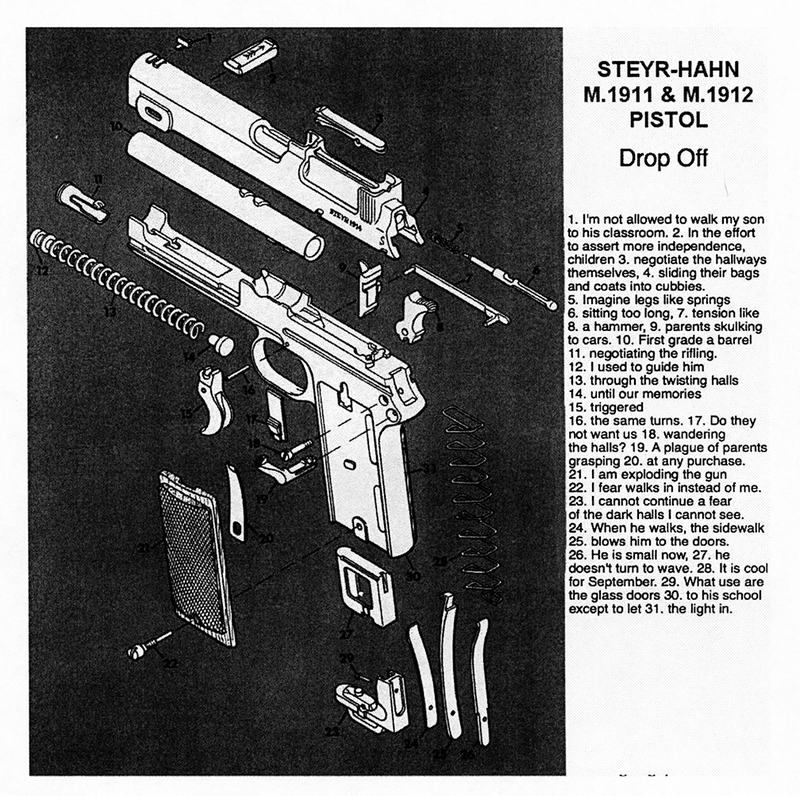 I remember fixating on all the pieces in the image of the disassembled gun. An exploded view of any gun shows a surprising number of parts that I simply don’t associate with weaponry. There are screws, the size of ones used to close the battery compartment of my youngest son’s nightlight. There are metal rods that I might confuse for pieces of their toys. There are so many springs that I remember gasping at the sight of them. How like Slinkies they are. How one might confuse them for the springs that come from push-button pens. The reaction was startling. I am not schooled in graphic design, nor do I have a truly visually artistic bone in my body. I want to draw, but stick figures were about my limit at the time. So I learned how to manipulate images, to eliminate what I didn’t need, to add what made sense to me to add. This would take me nearly another year, and during that time I worked on nearly nothing else. I sent the finished product out more to get it away from me than to have it seriously considered. At the time only a few magazines were able or willing to print anything besides text, so already the choices were limited. Indiana Review, however, had a “Folio: Middle Space” feature in their magazine at the time, and in late November of 2013 I sent it to them. Indiana Review accepted it four months later, in February of 2014. Along with questions of how they were going to make a grainy image work for their issue, they sent along, in the acceptance email, a small, ominous end note: We appreciated the ways in which this piece works as both provocation and subtle narrative and we are glad to include it in our journal. And in a return email about image resolution: Thanks for sharing your work with us—it provoked some very intense discussion among the editorial board, and we hope it does the same for our readers. I wasn’t sure what to say to such a thing. I hadn’t considered it a “provocation” and was suddenly gripped by the fear of the gun that I thought I’d put to rest long ago. But I soon realized they were right. Even torn apart, it had power. Even as a source of art instead of violence, it could be destructive. So many essays would come after this that took images and used them out of context to speak to something bigger. I slowly learned, with the help of a great many patient magazine editors, how to create sharper, better renderings of these public domain images. Different ways to interact with them. More complex relationships to the physical world. But none was more raw and emotional than that first one. None spoke to me even years after the final draft or the publication like “Drop Off” does. This is coming on the heels of yet another school shooting, this time in Florida. Nearly as deadly, it is this time in a high school. I’ve been quiet about it, and that generally signals to me that I’m sad and unable to articulate anything that won’t sound derivative or clumsy. Another form of helplessness. And again I’m turning to the page, as many writers do, I suppose. But what does it mean when the form you think you found to help you cope with what happened isn’t working? When even that daring, taboo juxtaposition that stirred so many emotions in you simply doesn’t work anymore? When you are numbed to the images, let alone the words that accompany them? I’ve gotten to the point where I can no longer write myself out of the sadness and confusion of why guns end up in schools. I’d sooner fill a page with semicolons than engage in a frustrating shouting match with an NRA member on Facebook. Five years ago writing an essay about watching my son walk away from me, into a place I once thought was safe but now seemed less and less so, helped. Not anymore. It just fills me with more sadness and frustration. Perhaps it is fitting that this essay comes back to me in my book this year. Reading it makes me feel that cold air skipping off the western New York fields, the slick sidewalks my son slipped down to get to school. We don’t live there anymore, but it is still with me when I read this essay again. My son is a fifth grader now, and he hears what is happening on the news. He is vaguely aware that he is a character in some of my work. Perhaps that essay can help him now. Dustin Parsons is the author of Exploded View: Essays on Fatherhood, with Diagrams (University of Georgia Press 2018) and teaches at University of Mississippi. His essays can also be found in recent issues of Hotel Amerika, Passages North, Proximity, and Zone 3.